SmartPublisher 7’s Goals provide a powerful tool for sales managers and salespeople to track progress in reaching a set dollar amount for a time period. 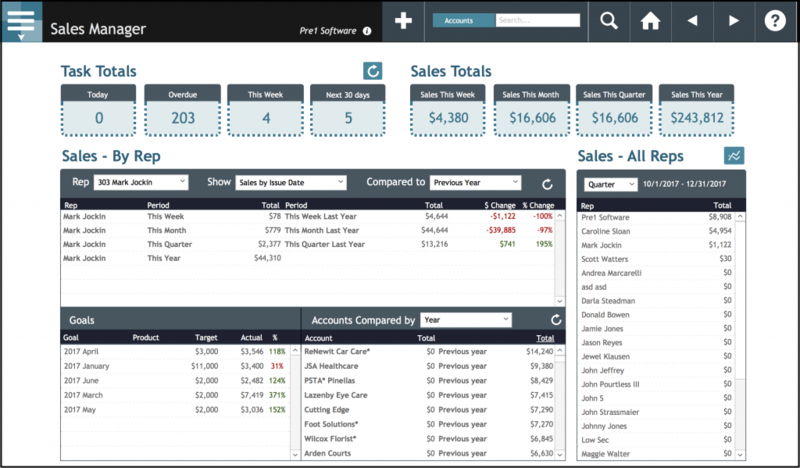 A sales rep’s current goals are viewed and graphed on the dashboard of the main menu. Goal management is done using the Goals portal on the sales manager’s main menu, where the goals are created, edited and graphed. Additionally, assigning a product to a rate is a great way to track revenue and sales goals based on different types of sales activity. Products are associated with rates, and are available to assist with creating and managing sales goals, as well as searching for insertions and sales. With the release of versions 7.0 and 7.2, the Sales Rep and Sales Manager dashboards received a total overhaul, making them more useful and interactive than ever. On the Sales Rep dashboard, tasks are broken down by to-do totals, which click through to lists of tasks. Accounts are broken down based on activity to more easily gauge expiring or inactive accounts in need of attention. A sales comparison portal shows totals by date sold or issue compared to the last period or last year. The Sales Manager dashboard features interactive lists for tasks and sales, including goals and comparisons by issue and time period.